LONGTIME FRIEND of the family, Betsy Anderson, had author Jo Haldeman sign the new book at Chevalier’s. Returning to a neighborhood where she lived and worked, Joanne (Jo) Horton Haldeman captivated a large crowd at Chevalier’s Books at the end of last month, just days after the publication of her book, “In the Shadow of the White House.” The book is a memoir of the Washington and Watergate years (between 1968 and 1978) that she experienced with her husband, H.R. “Bob” Haldeman. Bob Haldeman served as White House Chief of Staff to President Richard M Nixon. The Haldeman family lived in Hancock Park for many years (on Muirfield Road before leaving for Washington and on McCadden Place after their return — a total of 17 years in the neighborhood). Because of that and because Mrs. Haldeman worked for some of those later years as a real estate salesperson at Coldwell Banker on the Boulevard, many former neighbors, colleagues and longtime friends showed up for the book reading and signing. She was accompanied by her two daughters, Susan and Ann, who grew up in the neighborhood. 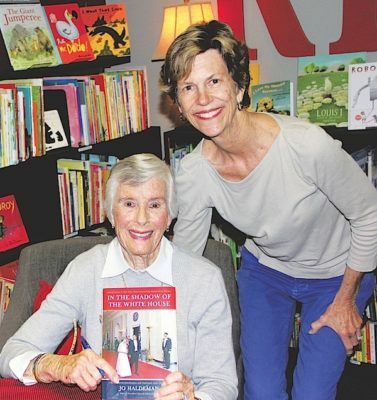 As Mrs. Haldeman said in her talk, it was the idea of sharing an extraordinary experience with her six grandchildren that stimulated her to write the book. She had encouragement from many quarters, and she had background information from weekly letters that she wrote from Washington to family members in California, which had been saved by her mother and mother-in-law. She also had as a source a detailed journal she kept during the 55-day trial of her husband, Bob, plus notes from the 18 months when he was in the federal prison camp in Lompoc, 150 miles north of Los Angeles. The book, which is a very personal recollection and includes many informal photographs taken by and of Mrs. Haldeman, is divided into five parts: California; The White House; Watergate; The Trial; and Prison. 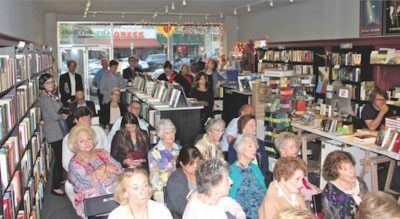 CHEVALIER’S BOOKS had a big audience for reading and signing of former neighbor Jo Haldeman’s book on the decade encompassing her White House and subsequent years. To read the book and flip through the photographs definitely is enjoyable for a local person brought up in this part of California. Depicted are familiar places in addition to Larchmont, such as enclaves in Newport Beach and Palm Springs. But, in the end, the book is one woman’s story of a 10-year journey, where she portrays both the highs and the lows. It’s a wonderful contribution to Southern California history and history on a wider scale. The book, quoting from a Nixon inauguration, reminds readers that, “until he has been part of a cause larger than himself, no man is truly whole.” The book is available at Chevalier’s and elsewhere.